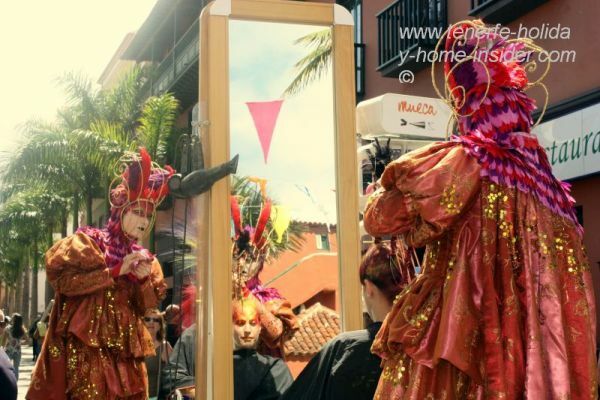 What makes the Mueca art festival tick? 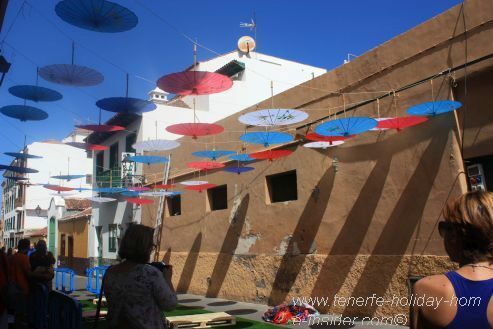 The Mueca art festival of street art in Puerto de la Cruz is a must. It's next event will be from May 10 - 13 of 2018.
to be lived again and again. It's on the move through a town like a giant dragon. It's growing by the year with new experiences for ever. By the way, the performance times of Bloko de Valle may vary every year. 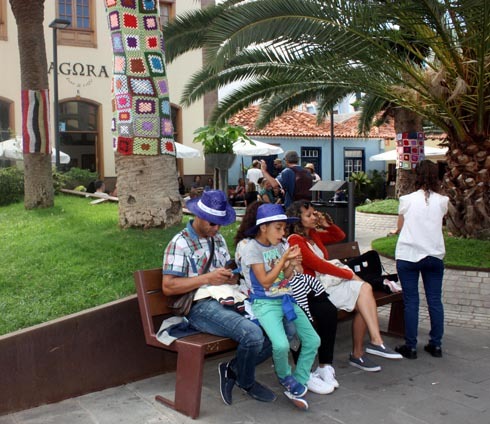 Mueca art festival 2017 highlight with Osadia street artists. Osadia Online provides information in several languages about themselves. Portrayed below is the popular Reyes Bartlet Children Choir before its performance El Brujo del Bosque(the Witch of the Forest) on Plaza de Europa in 2017. Reyes Bartlet Children choir and musicians getting ready. 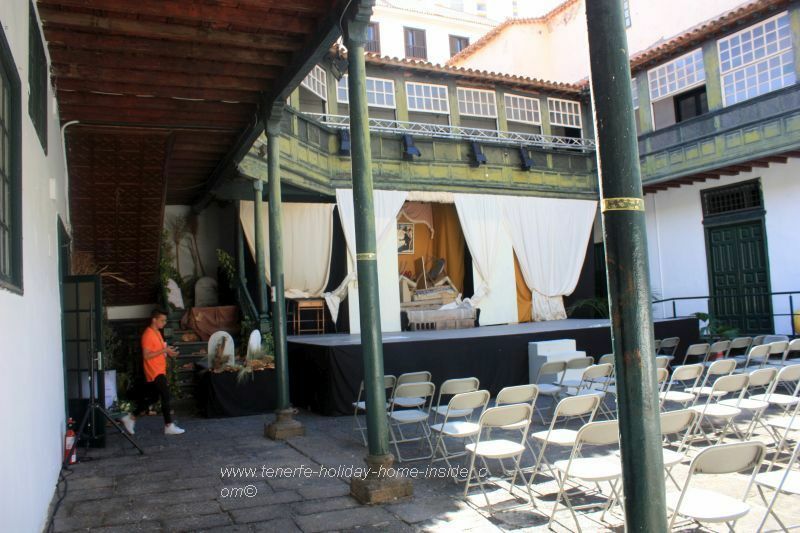 A theater stage at Casa Ventosa on Plaza de los Agustinos off Calle Iriarte before the evening performance which is in Spanish. 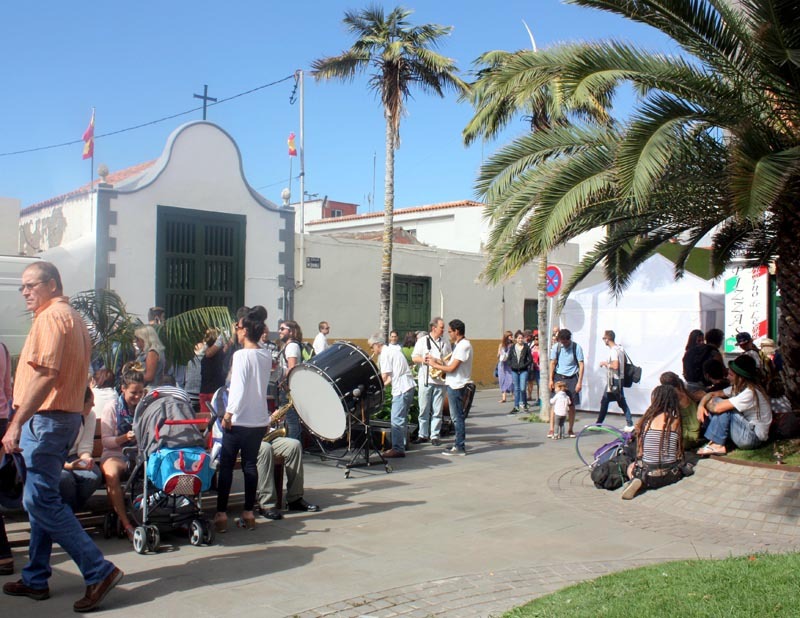 In 2017, the Muelle by the main town square Plaza del Charco was the spot to get the event's program and to buy tickets. This plaza is again the stage for the Bloko del Valle that's named very confusingly Espacio Loro Parque in the agenda. Way back in 2008 a group of simple street musicians were much applauded. Now, that has evolved. Who may play a part? That's the beauty of it; amateur or professional artists and craftsmen from all over the world are invited. Still and performing arts as well as crafts with or without workshops are welcome. New ideas for crowd entertainment or artistic novelties may be presented. Any machinery and giant equipment are prohibited. Circus acrobatic or any dance are part of its highlights. That excludes normal sport. 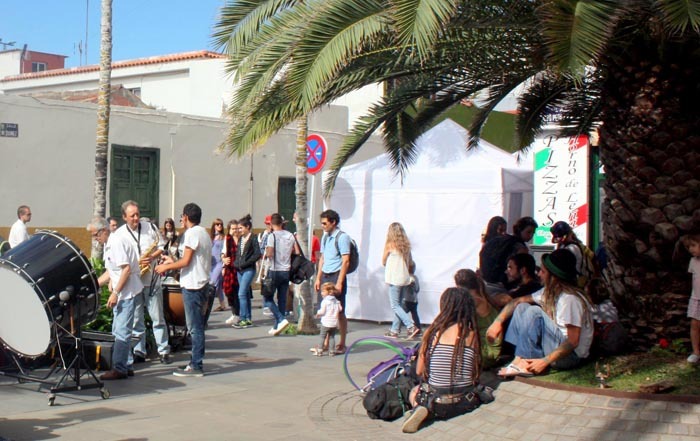 Novelty at the Mueca art festival 2016? This giant peace of art made of recycled timber captured many eyes in Calle Mequinez in the former fishermen quarters. By the way, a body painting demonstration was also part of new fun to see in 2016. 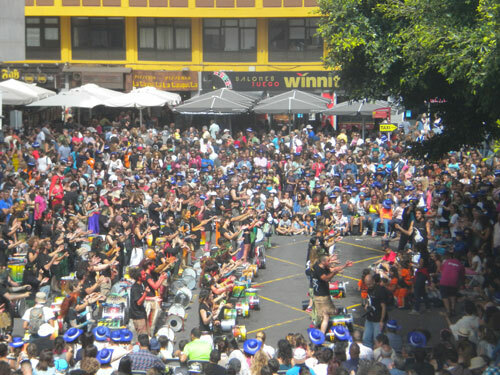 Mueca Art Festival with Band Bloko del Valle on Plaza del Charco. This band has made itself a name locally as well as beyond by a new way of drumming. It's awesome and different. How come ? Many of its dancing drummers are girls. 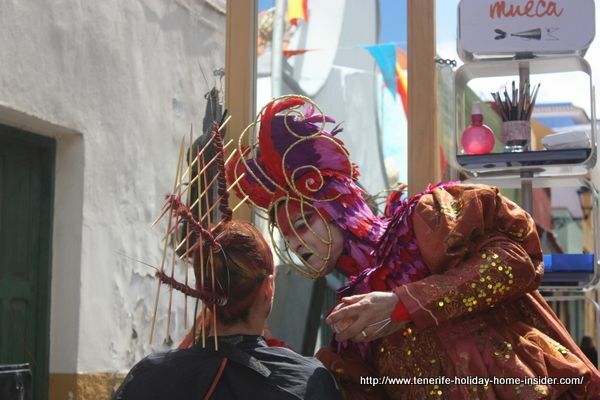 By the way, it will be back at the Mueca art festival every year, by the looks of it. 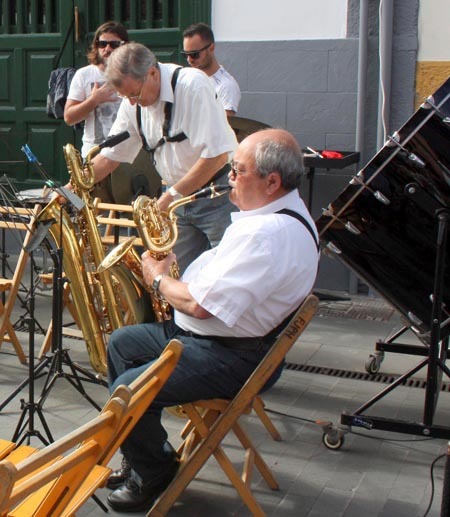 Below a somewhat smaller group of the band at the Mueca of 2015. Also often, they don't just beat the Tambours i.e. the drums. They may even chant. 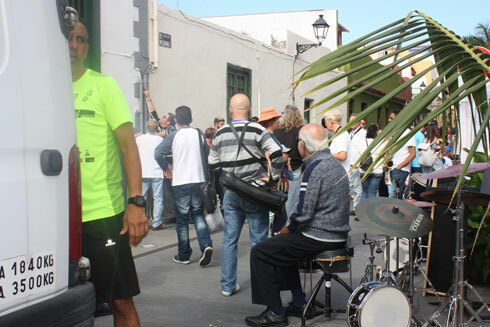 Thousands of fans had come early to enjoy their music in 2016 with more drummers on Plaza del Charco by 4p.m. The crowd made it impossible to get a close-up photo. However, the band's Samba and other sounds have no borders. I also heard it at Plenilunio at Plaza del Principe in Santa Cruz on April 23. There, the acoustics were better. How gather Mueca street festival info? By an illustrated offline booklet of 37 pages from a special cabin by the harbor. 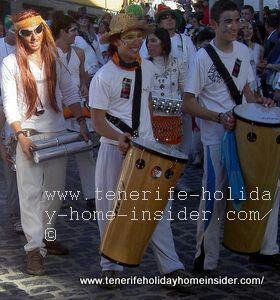 Carnival may only rival this Tenerife art festival by number of events when you include street dancing. 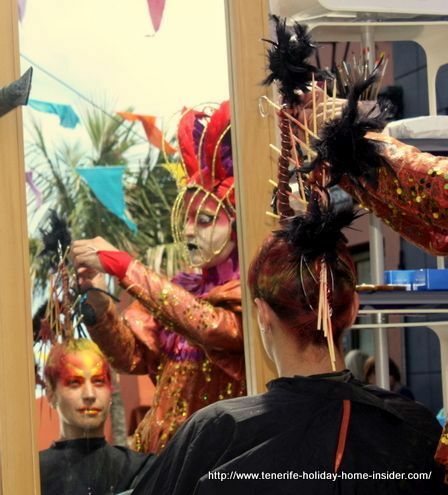 There may have been as many as 130 indoor and outdoor shows at the Mueca. Most of the performers registered already in December. Late comers were only listed under "varias compañias" (diverse performers). Something may be on at various points of these old quarters. Calle Mequinez, Calle Lomo, Calle San Felipe and Calle Puerto Viejo are most popular. 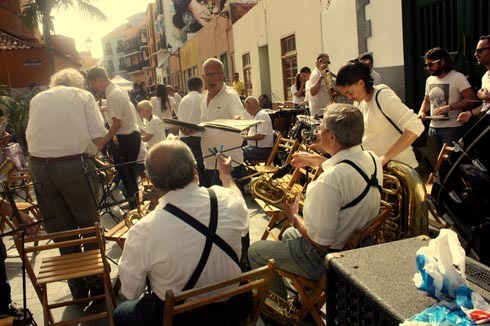 Jazz street musicians prepare a concert. Depicted are musicians. Some of them gather makeshift power for their loudspeakers. They find it from cables outside the chapel Ermita de la Plazeta. That's a picturesque courtyard by C/Mequinez, 53 in la Ranilla. It was too beautiful to see the young and elderly jazz musicians get ready for the concert. Their instruments didn't only look festive. They sounded divine. Later, an elderly Tuba player filled the air with mellow Jazz tunes. That was the first example of heavenly street music. Unfortunately, I had to go home early from the Mueca art festival. I had to feed my ailing old dog Jesse and forgot to ask for the name of the band. Later I couldn't trace it in the catalogue. Perhaps, the band had decided to perform last minute. Relaxation is a must during action packed events. Consider the following locations that are depicted below for event watching or to take a break. 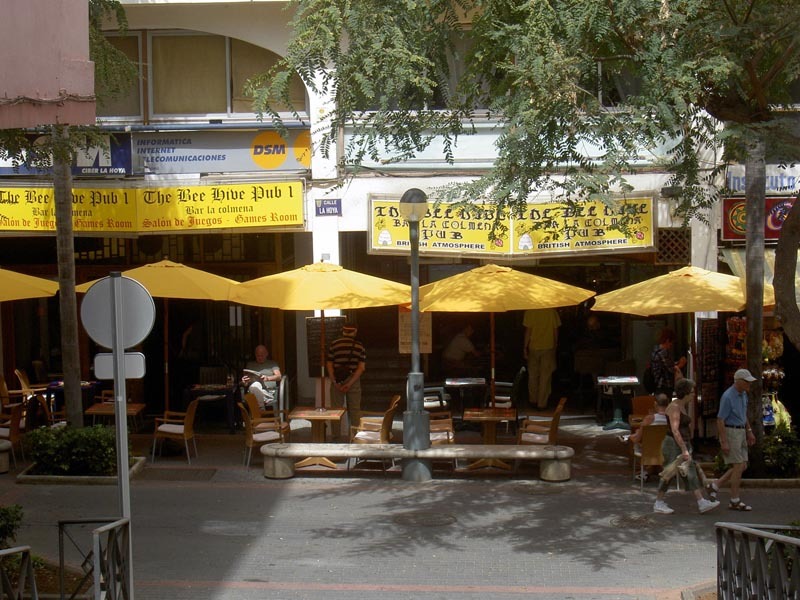 Best attended Ranilla restaurant terrace by 5 p.m. on Saturday May,14 was Restaurante Mille Sabores in Calle Cruz,5. I ate there several times and can vouch for it. Family with blue Mueca hats. Notice the family on a bench at La Plazeta. They all wear blue sombrero straw hats. The name of the festival was written on the sombreros. Many people with such blue head gear strolled all over town. A Clarinet player threw a last glance at the orchestra's partitura notes. 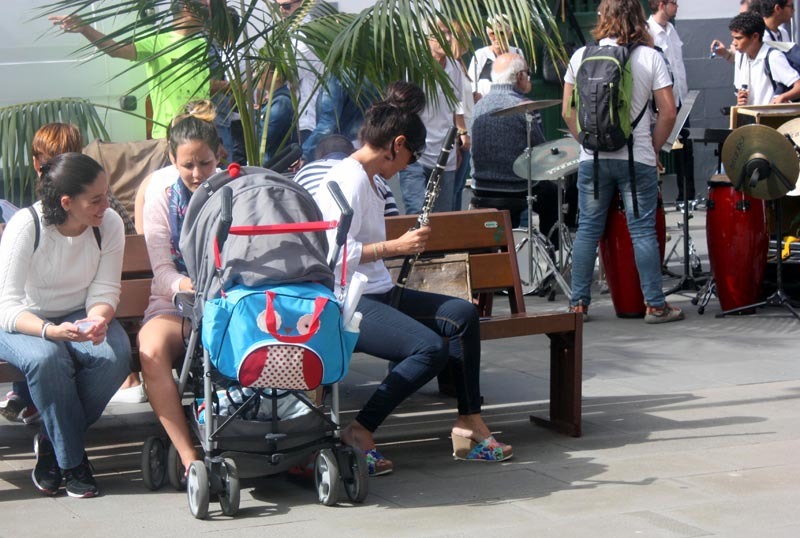 Other musicians placed chairs and musical equipment. A group of Rasta Bohemians looked on. They sat under the shade of an old Canary Pine. 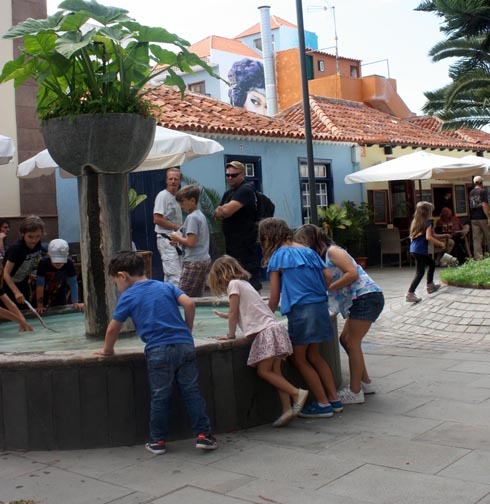 Kids were amusing themselves by the new fountain on la Plazeta square. Ideally, their parents could see them from the bars and cafés behind it. I spoke to a friend. She had joined a group of fifteen. 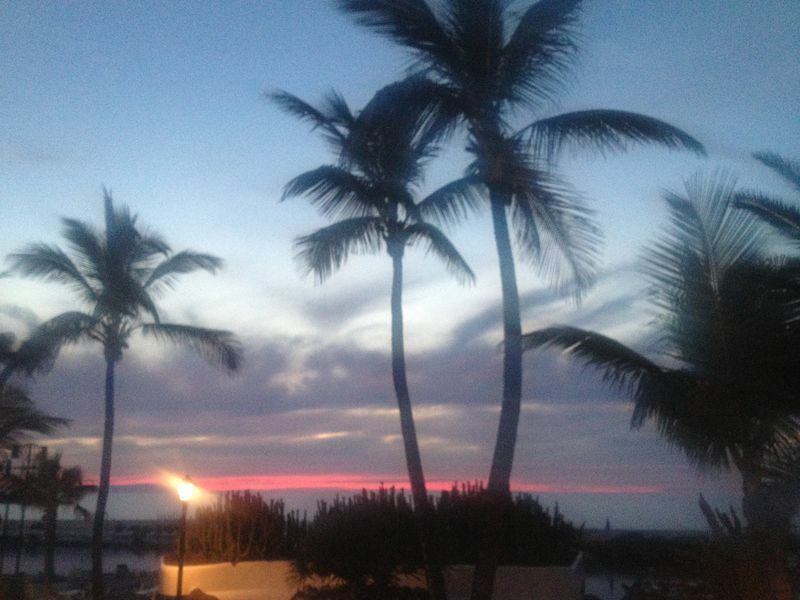 Later, they roamed the streets of the Puerto Cruz Mueca until 3 a.m. She said that they all had a fantastic time. She saw the circus show by Plaza de Europa and many more spectacles. It was impossible to see them all, she said. Why? More than one venue was staged at a given time. 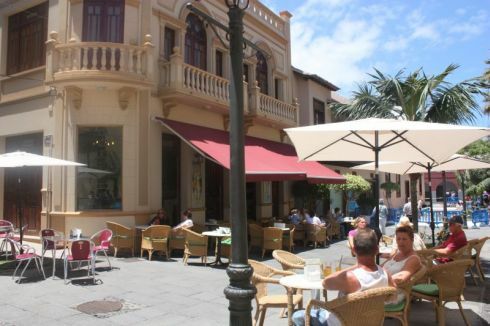 Location: All over in the Puerto de la Cruz hub. Time of year: : Always a few days after the May Fiestas. Duration: 4 days at various hours of day and night. 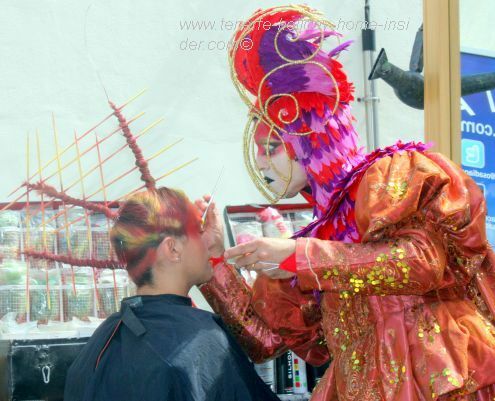 Event entrance fees: From €5,-- to €10, while street shows are normally for free. Of course, no fun fair was at the Mueca art festival. 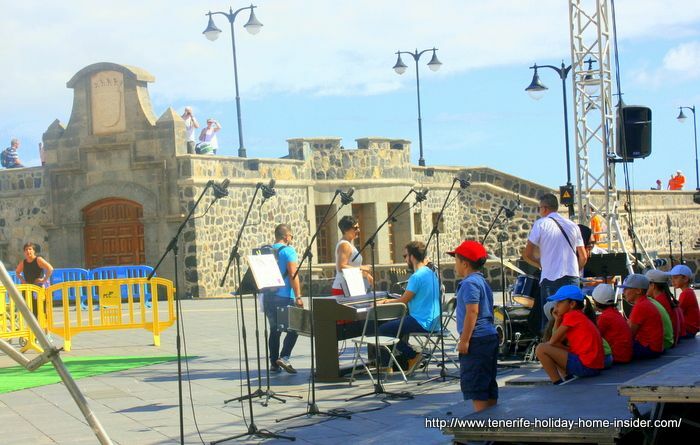 Usually, it's a part of other Fiestas by the port Muelle with its docks and jetties. However, it wouldn't fit in with the Mueca art theme. Also, gigantic, additional space was needed for parking. None was left there when we arrived on that Saturday May 14 of 2016 at lunch time. 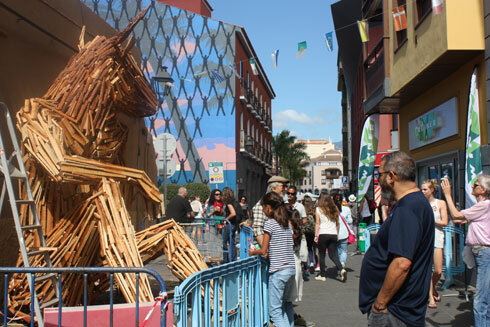 Learn more about the latest Tenerife's biggest street art festival dubbed the safe one by the organizers here. It includes all events, parking options as well as extra bus lines and more. From Tenerife Mueca back to Puerto de la Cruz.